Dopo aver fatto sempre e solo tanta salsa di pomodoro, quest'anno ho voluto provare a fare anche i pelati. Sono più semplici da preparare, anche se il fatto di sbucciarli uno per uno porta via un po' di tempo. Meglio usare dei bei S. marzano maturi e integri. - Sbollentare i pomodori per un paio di minuti (non di più) in acqua bollente (i più maturi si creperanno da soli), scolarli, aspetta un attimino che raffreddino e pelarli (se ho fretta indosso i guanti di gomma da cucina e procedo da bollenti!). - Metterli a scolare per lasciare l'acqua in eccesso finchè si completa di sbucciare gli altri. - Invasarli mettendo qualche foglia di basilico e schiacciandoli leggermente in modo da non lasciare spazi tra loro. - Chiudere i vasi, avvolgerli in stracci e metterli a sterilizzare in un pentolone contando 30/40 minuti dal bollore (l'acqua deve ricoprire i vasi di 4/5 cm.). - Si lasciano poi raffreddare completamente nel pentolone, per poi conservarli in dispensa. leggendo questo articolo apparso sulla Stampa nel maggio 2008 i pomodori aiutano la pelle a combattere rughe e scottature, basta mangiarne 5 al giorno! Ricercatori dell'Università di Pisa hanno constatato che innaffiare i pomodori con acqua di mare li aiuta a sviluppare più vitamine ed antiossidanti, utili per le loro proprietà contro i problemi cardiaci e alcuni tumori. 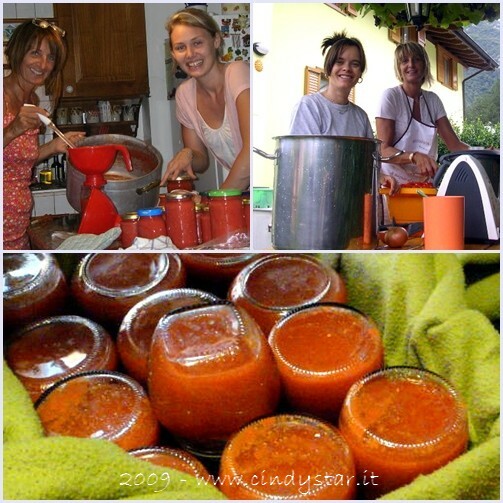 Last week I blogged tomato sauce recipe, and that is how I have always made with success in these past years. 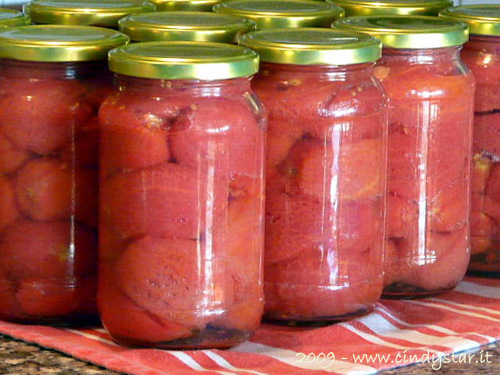 As I had some more tomatoes left, the other day I bought new jars and dedicate a whole afternoon in making them homemade canned. I should say it's a little bit easier but certainly not quicker: you have to peel them one by one and it takes away a bit of tim,e but if you are not alone (... and I was helped by my first daughter-in-law!) ... that definitely works in fun! Better use ripe but firm S. Marzano tomatoes. 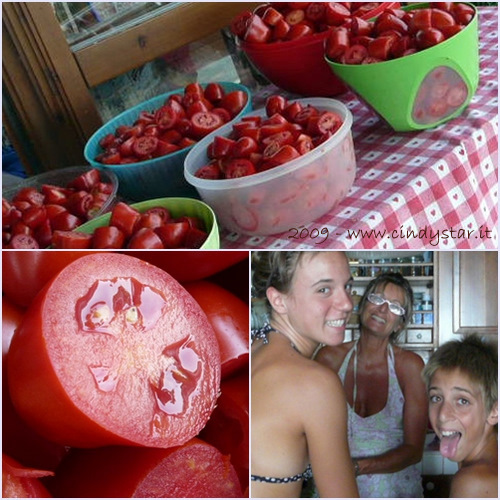 - Blanch tomatoes for a couple of minutes (no more) in boiling water (the riper ones will crack), drain, wait a little bit cool and peel them (or wear rubber Kitchen gloves and go ahead! ), the skin should slide off. - Put them to drain excess water until you end up with the others. - Put then in jars with a few leaves of basil pressing lightly so as not to leave spaces between them. - Close the jars, wrap them in kitchen cloths and put them in a bigpot to sterilize counting 30/40 minutes from boiling (water should cover 4/5 cm. the jars). - Allow to cool completely in the pot, then they are ready to be stored safely in your pantry for up to one year. you can read in this article how tomatoes helps the skin to combat wrinkles and sunburn, you just have to eat 5 a day! Researchers from University of Pisa have found that watering tomatoes with sea water helps them to develop more vitamins and antioxidants, very useful for their properties against heart disease and certain cancers. un tramonto rosso sul lago e la luna crescente che si alza. Il Prosecco profumato ai frutti di bosco richiama gli stessi colori. i lumini accesi poi la renderanno magica. 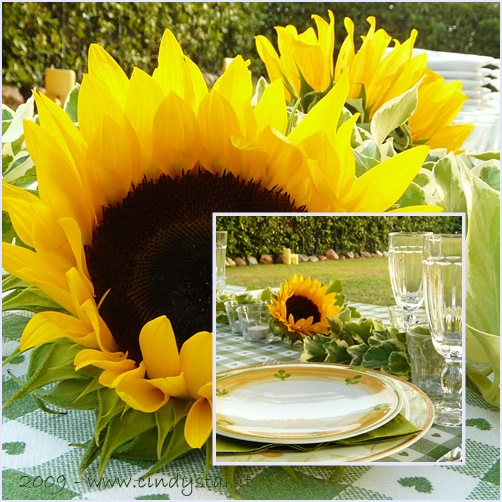 Un coro allegro e festoso per gli auguri più cari! 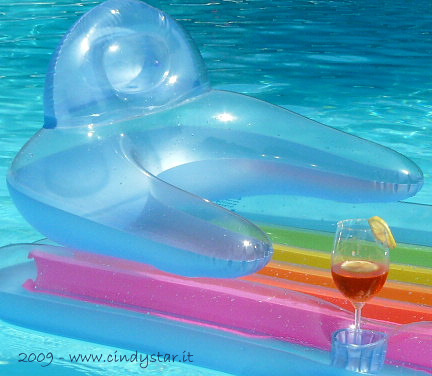 Ferragosto is synonymous with vacation and sweet laziness, Italian "dolce far niente". 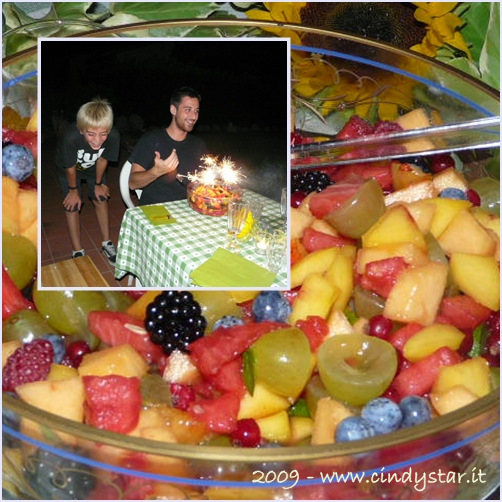 It is a typical Italian holiday (I should say the most typical) celebrated in August, 15th and it represents the very clou of Summer vacation. Once most people used to go on holiday only in August (and some factories and industries do still close their production facilities and offices in this month) and Ferragosto time was choosed for a visit to their village and families, especially for emigrants. It is also a religious festivity to commemorate the Assumption of the Blessed Virgin Mary: holy processions, celebrations and fairs are held in towns and villages all around the country and later in the evening performances of sparkling fireworks light up the sky in a riot of colors and sounds. 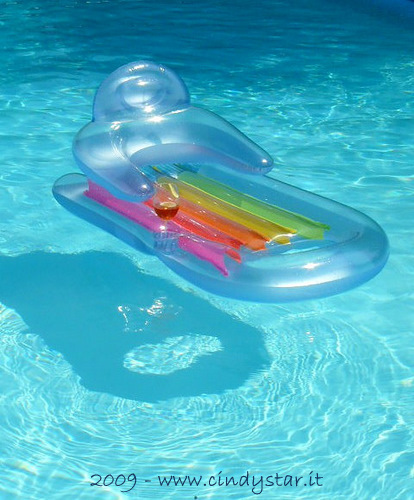 Last weekend we had friends at home, the weather was really hot and sunny, and we had a very relaxing time. No troubles and worries, no obligations of scheduled timing, only a great time talking and laughing, sunbathing and jumping into the pool, lazing for a siesta in the shadow of my big umbrella pine, refreshing our mouths with a a huge chilled watermelon in the afternoon and ending with a scrumptious BBQ (men's work!) 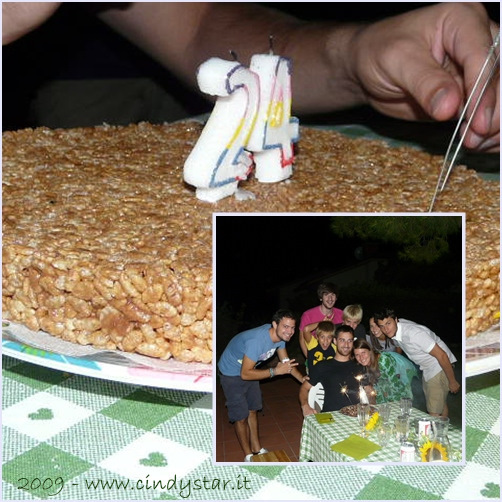 and a large homemade pizza, schiacciunta and Rice Crispies and Mars cake. And relaxation was so high that I was not ready in time to blog my recipe last WHB hosted by Anh from Food Lover's Journey, silly me! But first, we all toasted together to Summer with a glass of Aperol Spritz! And ... we could not be lazy all time long ... would have felt a little guilty! I had bought about 30 kg. 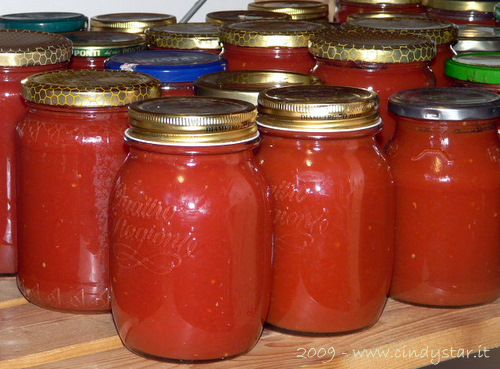 of S. Marzano tomato to make sauce to store and my friend Tiziana had brought her empty jars to be filled. We asked our youngest kids to help in washing and cutting tomatoes. They did a perfect job, on their own and without supervising, and Tito (my fifth son) took these nice pics, even better than me! I have been doing this sauce for years, you can dedicate a whole day to make a large quantity necessary all year through (I usually cook 80/100 kg.) or work on small amounts each day, a box is about 8 kg. and you need 1 1/2 hour to do it on your own. But every time you open a jar it will be a huge satisfaction: bright red color, smooth texture and authentic taste will intoxicate your senses! And believe me, working with friends is real fun, so don't forget to ask them to help you! Every 8/10kg. of tomatoes get about 3 onions, 4 /5 carrots and 4/5 sticks of celery, herbs as you like. 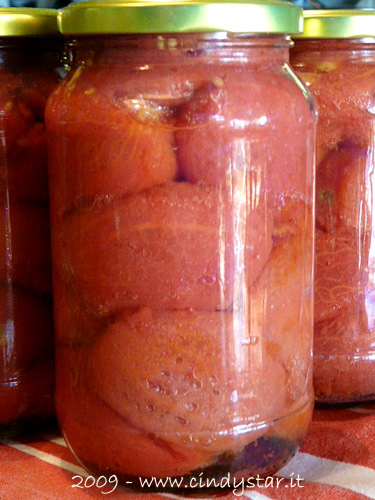 - First leave jars in the oven at 100° to sterilize at least one hour. - Boil lids 15 minutes, drain on kitchen paper. 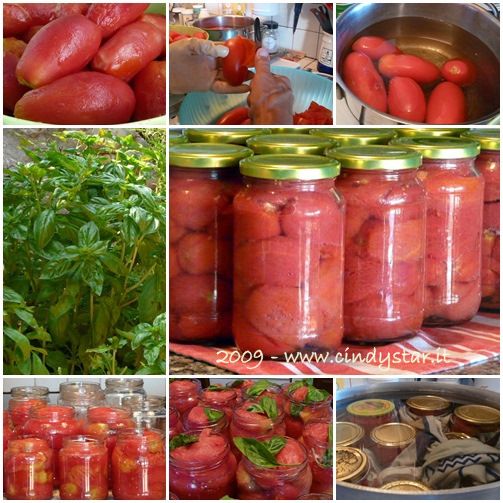 - Wash tomatoes, vegetables and herbs. 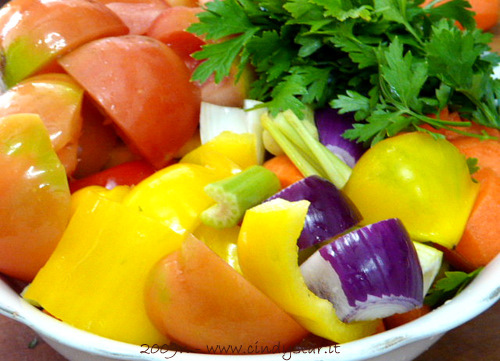 - Chop vegetables into pieces (just cut tomatoes in half). Then let them drain in a large bowl to loose water in excess for about 20/30 minutes, we will have a less liquid sauce. - Turn on the blender bowl (or Thermomix) to medium speed, and insert some tomatoes, some vegetables and herbs and get to maximum speed for a couple of minutes. - Place in a cauldron on medium fire and repeat with all vegetables. - Add a little salt and boil for at least 40/50 minutes or until it reaches the desired consistency. 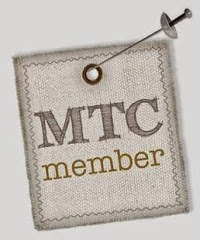 - Pour hot sauce in hot jars (be careful and use kitchen cloths to handle them) up to half a centimeter from the edge. Close immediately and turn upside down, putting the jars in a box lined with an old blanket. Cover the jars with the blanket and leave to rest until completely cooled, usually a couple of days. 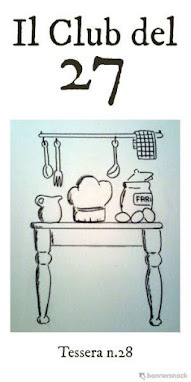 - Then store the jars in the cellar or in your pantry. This sauce is good for any dish you want to prepare and whenever you need it! 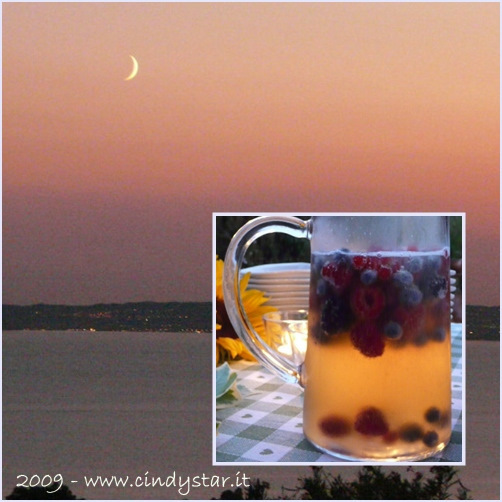 See recipe in Italian for step by step pics. Fa caldo, caldo, caldo, ma al caffè non si può rinunciare. La mattina lo bevo volentieri caldo, non potrei affrontare meglio la giornata, ma durante il giorno, poi, è piacevole, rinfrescante e dissetante berlo freddo, ma shakerato. Si dice che i migliori caffè shakerati si gustano nei bar di Milano, dove c'è proprio una predilizione nel farlo. Si può aromatizzare a piacere con un goccio di liquore alla vaniglia, amaretto, mandorle o della crema whiskey (Baileys) che lo renderà più corposo. zucchero: meglio usare quello liquido, altrimenti non si scioglie bene nella preparazione fredda. Per fare lo zucchero liquido sciogliere sul fuoco acqua e zucchero (60% zucchero 40% acqua) e far raffreddare, conservare in bottiglia. Mettere tutti gli ingredienti nello shaker e shakerare vigorosamente per una decina di secondi, il ghiaccio non deve sciogliere ma solo raffreddare la preparazione. Più energicamente si shakera più si formerà la caratteristica e deliziosa schiumina. Versare in tumbler bassi, o meglio ancora in coppe Martini, atttraverso il colino terminando con un bel giro di schiuma. We are still having a hot weather in Italy, coffee is still a good friend for me, but ... not in the classic serving! I like it hot n the morning, I could not even think to face the day without it, but during the day, at very high temperatures, it is enjoyable, refreshing and thirst-quenching to drink it cold, but shaken. 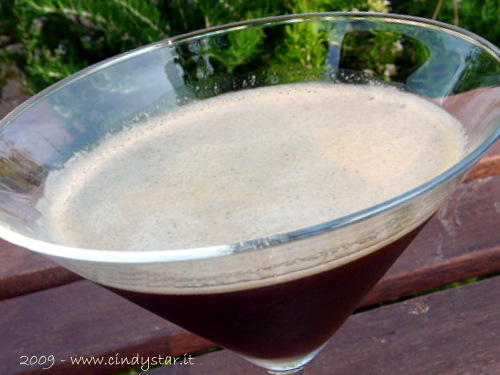 It is said that the best shaken coffee you can enjoy is in Milan,'s bars, where barmen have a real culture to make it. You can add flavor if you like with a drop of vanilla, amaretto, almond liqueur or whiskey cream (Baileys) that will enhance its texture. Sugar: better liquid, or it will not dissolve well in cold preparation. To make liquid sugar boil water and sugar on fire a few minutes (60% sugar 40% water), then let cool and store in a bottle. Place all ingredients in the shaker and shake vigorously for about ten seconds, the ice should not melt but only cool/ice the preparation. More vigorously you shake more foam will be formed. 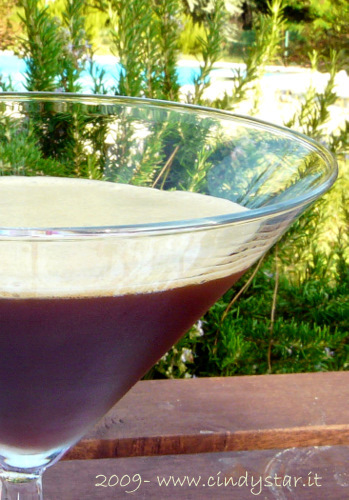 Pour into low tumbler or better in Martini glasses, using the strainer (no ice in the glass!) ending with a fine round of foam. 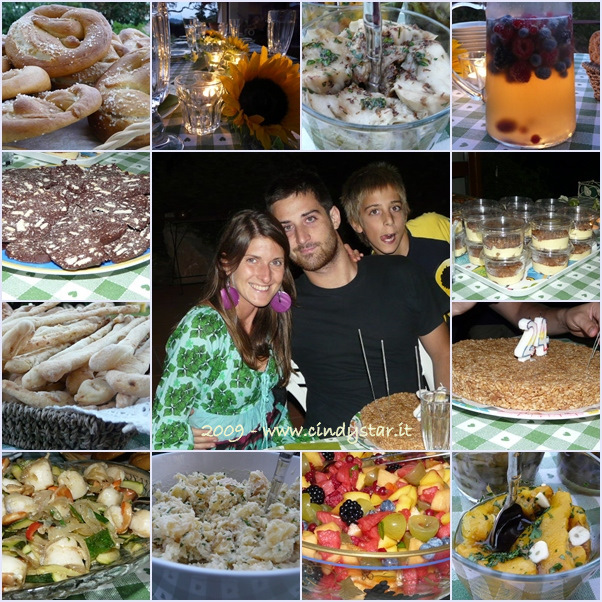 E' una vecchia ricetta che aveva postato Silvietta sul forum di Cookaround che ho sempre apprezzato. 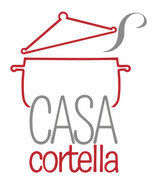 Si chiama modenese perchè è una ricetta di casa della sua nonna di Modena. 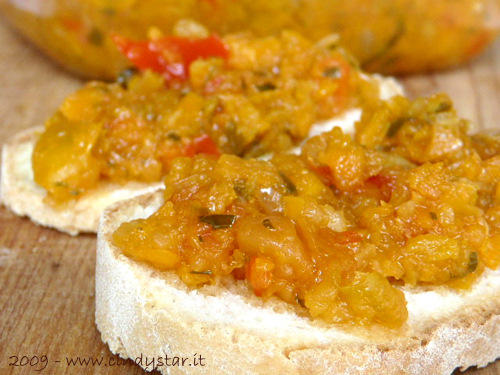 Si sposa benissimo sia con le carni che con il pesce, alla griglia, lesse o in umido, accompagna con brio un bel piatto di salumi e formaggi, è un ottima bruschetta per delle fette di pane tostato (anche agliato), accompagna un fresco aperitivo servita con dei crostini. A voi la scelta! 1. Lavare e tagliare le verdure a pezzi grossolani, eliminando i semi dai peperoni e dai pomodori. 2. Sminuzzare le verdure una alla volta nel Bimby o in un robot per pochi secondi a velocità media riponendole in uno scolapasta a perdere l'acqua in eccesso. 4. Cottura tradizionale: versare le verdure in una pentola, meglio se antiaderente, aggiungere l'aceto e il sale e cuocere a fuoco basso e copeerto per 45/50 minuti, mescolando ogni tanto. 5. La verdura non deve sciogliersi ma cuocersi rimanendo abbastanza croccantella. 6. A fine cottura aggiungere qualche cucchiaio di olio a crudo e invasare. 7. Si conserva 15 giorni in frigo, altrimenti sterilizzare i vasetti in acqua in un pentolone (l'acqua deve ricoprire di 4/5 cm. i vasetti) contando 15 minuti dal bollore e lasciando raffreddare completamente nel pentolone. In questo modo si potrà gustare in inverno nei momenti di nostalgia dell'estate passata! 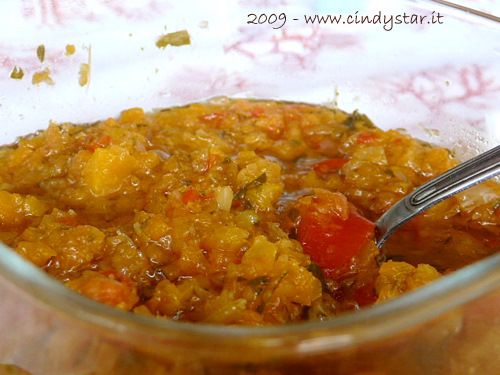 This sauce is an old recipe posted by Silvietta on Cookaround forum years ago. I have always appreciated it and prepared every Summer when vegetables are fresh and so inviting! It is called modenese because the recipe comes from her grandmother's house in Modena. It goes well either with grilled, boiled or stewed meat or fish, it's nice and tasty with cheese and ham, it's an excellent ingredient for toasted bread (garlic too), and a fresh appetizer served with crostini. Choose your favorite! 1. Wash and cut vegetables into pieces eliminating seeds from peppers and tomatoes. 2. Chop vegetables one at a time in Thermomix or food processor for a few seconds at medium speed putting all in a colander to lose excess water. 3. Cooking in Thermomix: insert butterfly, add vegetables, vinegar and salt: 45/50 min. 100° vel. 1 (or gentle stir setting in TM31). 4. Traditional Cooking: pour vegetables into a pot, preferably non-stick, add vinegar and salt and cook over low heat covered with a lid for 45/50 minutes, stirring occasionally. 5. The vegetables should not melt but cook still remaining a little crispy. 6. At the end of cooking add some tablespoons of oil and pour in glass jars. 7. You can keep the sauce 15 days in the fridge, for longer I suggest to sterilize the jars in water in a big pot (water should be 4/5 cm. over jars' lids) counting 15 minutes from boiling and allowing to cool completely in the pot. Then they are ready to be kept in your pantry and consumed during winter to recall a fresh summer taste in your dishes! Ecco un piatto semplice ma gustoso, tipico dell'isola d'Elba e della sua tradizione popolare. 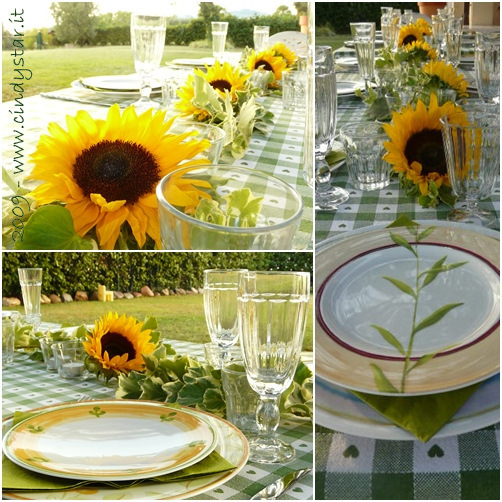 E' un piatto tipicamente estivo, preparato con verdure fresche di stagione. E' ottimo come contorno, sia per carni che per pesce, ma si può gustare anche freddo (meglio se fatto il giorno prima) o servirlo con delle bruschette di pane agliato. 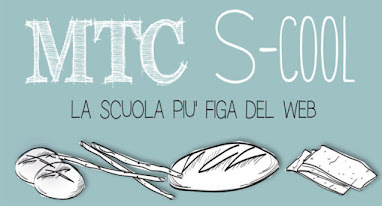 Il suo nome significa di tutto un po'. 1. In una padella alta mettere un bicchiere di olio con la cipolla a fettine, il prezzemolo e il basilico tritato (e il pizzico di peperoncino se si mette) e lasciare imbiondire. 2. Tagliare le verdure a pezzi (meno i pomodori) ed unirli alla cipolla iniziando dalle patate. 3. Cuocere a fuoco vivace per 10/15 minuti quindi unire i pomodori a pezzi (sbollentati un attimo per pelarli). Salare. 4. Proseguire la cottura a fuoco moderato e con coperchio, ci vorrà 30/40 minuti, dipende dalla grandezza dei pezzi di verdura. 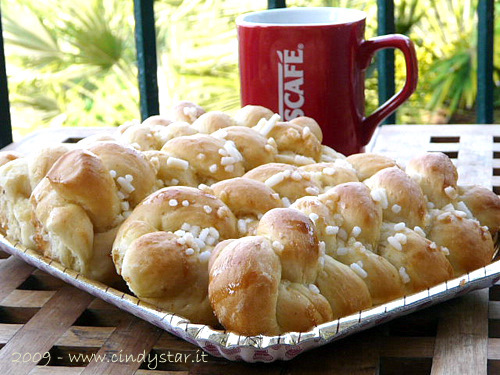 A simple but tasty dish from Elba island, a beautiful and sunny place where I've been spending my vacation for years. 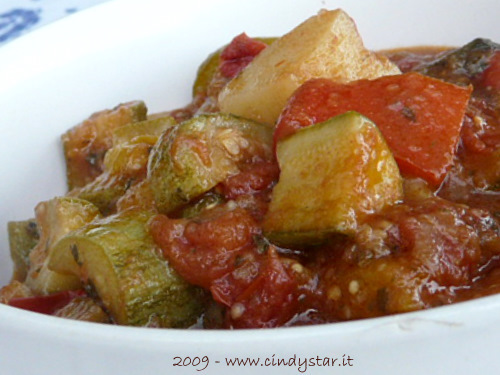 It's a typical summer dish, prepared with fresh seasonal vegetables, a sort of ratatouille. Perfect as a side dish, both with meat or fish, you can also enjoy it cold (better if prepared in advance) or served with toasted garlic bread. Its name means a little of everything. 1. Put a glass of oil in a large pan and fry sliced onion, chopped parsley and basil and chili. 2. 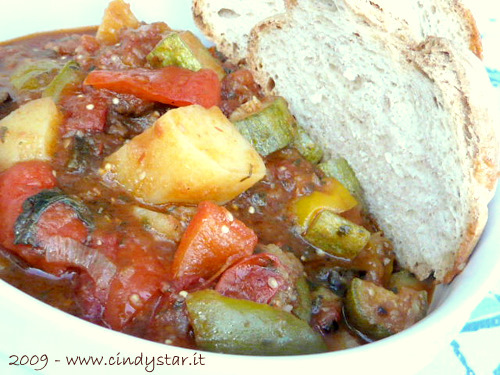 Cut all vegetables into pieces (not tomatoes) and pour in the pan, starting with potatoes. 3. Cook at high for 10/15 minutes and then add cut peeled tomatoes (boiled a minute to peel them easily). Add salt. 4. Cook cover at moderate heat about 30/40 minutes, depending on the size of vegetables. It's time to bake together again and this month we are all invited by Stefanie to have breakfast with her. She is asking for Sweet Breads to bring to her table, where her best tablecloth is on and steaming cup of coffee and tea are waiting for us! So, don't waste any time and make her wait for long, hurry up and enjoy a lovely breakfast together! Melt yeast in water, add sugar, butter, milk and flour and mix well adding salt at last. Add candied oranges or zest. If you do not like to feel the pieces under your teeth you can whip them and they will dissolve while baking. When the dough is pretty smooth and homogeneous, let it rise in a buttered covered bowl until doubled. 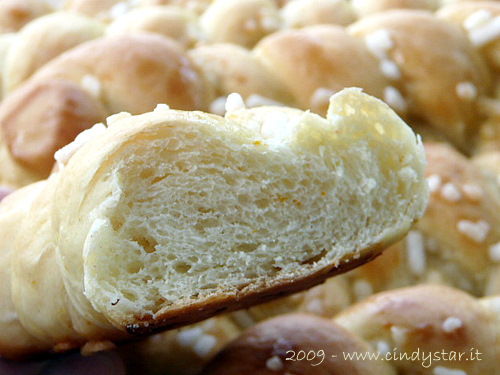 Divide the dough into 11/12 pieces , divide each piece in 3 parts, roll them and give a plait shape. Place well-spaced on a baking tray (covered with baking paper), brush with beaten egg and sprinkle with granulated sugar or poppy seeds. Let rise again 30 minutes, then bake at 200° for about 20 minutes. You can add some raisins in the dough if you like. Sciogliere il lievito nell'acqua, aggiungere lo zucchero, il burro, il latte e la farina e impastare bene aggiungendo anche il sale per ultimo. Unire anche i canditi o la buccia di arancia. Se non piace sentire i pezzetti dei canditi sotto ai denti si possono frullare e si scioglieranno in cottura. Quando la pasta sarà bella liscia ed omogenea, metterla a lievitare in una ciotola leggermente imburrata e coperta fino al raddoppio. Dividere la pasta in 11/12 pezzi, dividere ciascun pezzo in 3 parti, fare dei piccoli rotolini e formare le treccine. 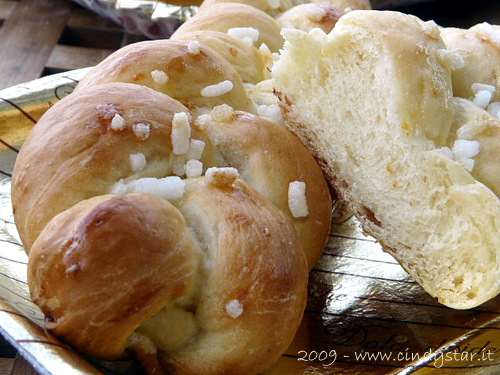 Adagiarle ben distanziate sulla placca del forno ricoperta di carta forno, pennellare con l'uovo sbattuto e cospargere di granella di zucchero o semi di papavero. Lasciare lievitare ancora 30 minuti, quindi infornare e cuocere a 200° per circa 20 minuti. 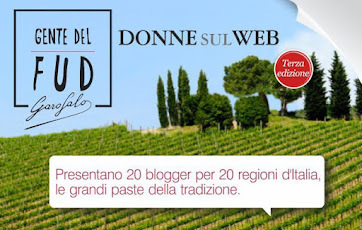 Se piace, si può aggiungere dell'uvetta nell'impasto.